—the strange case of an "empty chapter" in Italian music. 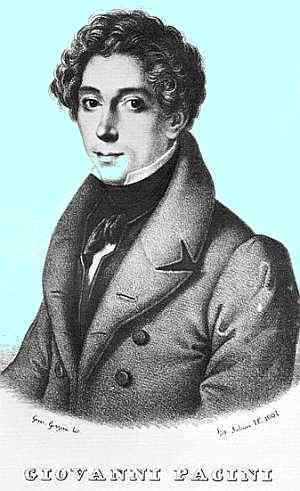 Giovanni Pacini (1796-1867) was born in Sicily, but I think I can sneak him into Naples since (1) many of his works were premiered at San Carlo; (2) he was the musical director of San Carlo for two years in the 1820s; and (3) once upon a time “Naples” meant the kingdom of Naples, including Sicily. Besides, obscure composers fascinate me. There follows a review of the performance of Saffo (good) and of the work itself (“…we have few modern works that contain so many evidences of rare and cultivated gifts…[of]…profound drama, unusual melodic gracefulness and great originality and vigor…”). From the date of the review, the critic was comparing Pacini favorably to Rossini, Donizetti, Bellini and even Verdi. Not at all shabby, and certainly not a recipe for obscurity, but history does what it does, sometimes not kindly. Berta di Varnol (April 6, 1867 ). Saffo is Pacini's best-known opera; it premiered on November 29, 1840. The libretto was by Salvatore Cammerano (1801-52) (who also wrote the libretti for Donizetti's Lucia di Lamermoor and Verdi's Luisa Miller). Saffo has been revived occasionally over the years. It was last performed in Naples in April of 1967 featuring the great Turkish soprano, Leyla Gencer, in the title role of Sappho. The review in the Neapolitan daily, il Mattino, on April 2, 1967, was totally laudatory. The critic, Alfredo Parente, praised the production, singers, the quality of the work, itself, and the skill of maestro Rubino Profeta (1910-1985) (a Neapolitan violinist, composer and eventually artistic director of San Carlo from 1972-74) who had to reconstruct the opera from Pacini's manuscript in the archives of the San Pietro a Maiella conservatory since the published Ricordi scores had not survived damage from WWII. Like most who have written about Pacini (and there are not that many), the critic is puzzled by the fact that this work of "great dignity and originality" comes from one who is an "empty chapter" in Italian music. When he says empty, he means empty; that is, there isn't even negative opinion about Pacini. There is NO opinion. Yet, says the critic, Pacini fits in perfectly, as do Rossini, Bellini and Donizetti, between the music of Cherubini (1760-1842) and Verdi in the history of Italian music, and he certainly deserves to be mentioned in the same breath with those three great names —or at least Pacini deserves to be fairly passed or failed in comparison to them; yet, that has not happened. This fertile and original composer has simply "disappeared from musical remembrance." Perhaps the answer lies in the time-line. Rossini quit writing opera in 1829 (he lived another 40 years! ); Bellini died in 1835 at the tragically young age of 34. Donizetti died in 1848. All three of them are "pre-Verdi," (although there is a brief overlap between Donizetti's last and Verdi's first works). None of them is seen historically as being in competition with Verdi, who composed from 1840 to 1900. Pacini, on the other hand composed from 1815 to 1867, which puts him in direct comparison with Verdi, a composer so stunningly creative and prolific that not only is he number 1 in Italian opera for entire decades, but as the Latin phrase has it: "ubi maior, minor cessat"—roughly, no one is in second place! It is perhaps justifiable “shorthand” to refer to Bellini and Donizetti as “co-founders” of the new sounds of Italian lyric Romanticism* that paved the way for Verdi, but if Pacini had stopped composing sometime in the 1840s after a string of success (that started with Saffo), he might, paradoxically, be remembered as part of that group. After all, not even Verdi’s Nabucco (1842) was initially as well-received and as popular as Pacini’s Saffo. Instead, Pacini periodically retired for a few years at a time to take stock. He would wander off to teach composition at a conservatory or give private lessons; then he would stage a come-back. At one point (in the 1830s) he is reported to have said that he had been "surpassed by the divine Bellini," but he overcame that crisis and had a particularly fine decade in the 1840s. Surely, sometime in the early 1850s, he must have had a chance to listen to the music of this young whippersnapper, Giuseppe Verdi, and have heard in only two years (1851 and 1852), Rigoletto, il Trovatore and la Traviata —heard, as it were, the Verdi juggernaut picking up speed right behind him. Even then, Pacini didn't quit; his last real success was Il Saltimbanco in 1858. He wrote music until he died (in December of 1867). His last opera, Berta di Varnol, had premiered in Naples just a few months earlier. *I am not overlooking the great debt to "the new sounds of Italian Romanticism" owed to the definitely not obscure Rossini, himself, who shifted the entire focus of opera away from classical mythology to events of more contemporary European interest. My entry on Rossini covers that. It simply has to be the case that if you write 70-plus operas, some of them will be less memorable than others, but some will be good and some may even be great. In his day, Pacini was judged very highly by his contemporaries, which fact bespeaks at least a claim to greatness. But time and history placed him up against one of history's truly great musical spirits, Verdi. It's something like being a polymath in 1500 and not being Leonardo da Vinci. No one is in second place. If you are concerned about the similarity in names such as Puccini, Piccinni, and Pacini. I have checked other (P+vowel+c(c)+in(n)i) combinations. The names Pecini and Poccinni exist, but one is a lawyer and the other a kick-boxer. But Meyerbeer and Wagner and the Verdi of Forza de Destino, of Don Carlos, of Aida, have found a powerful rival, a true titan, in the immense and stupendous finale of the second act. -La Riforma, October 28, 1873. The Carnival season of 1857-8 opened on Tuesday, the 26th of November, with [Lorenzino de' Medici], a superb opera by Pacini, and one that for a time made me stagger in my Verdi faith...It is so fresh, so original, and combines musical science so well with ear-haunting and simple melody, that it appears to me astonishing that it has not obtained a reputation out of Italy. -Dwight’s Journal of Music, July 2, 1858. Mr. Foley also calls my attention to recent performances of Pacini's music: "...his wonderful cantata Edipo Re (Vicenza, 1847), the world premiere of his C-minor Requiem a year ago in Catania, and this year’s revival in Giessen of Maria Regina d’Inghilterra." (Fans of obscurity will note that the performance of the C-minor Requiem was a world premiere. It had never been performed(! ); the score was discovered in 1992 languishing in the Naples conservatory.) Mr. Foley also reminds me how difficult it is even to know with any precision exactly how many operas Pacini wrote; the composer's autobiography Le mie memorie artistiche, is not particularly reliable in that regard. Thus, the mystery of why this deserving composer has "disappeared from musical remembrance" remains a mystery and, in my view, is unlikely to be solved. It might be a strange mixture of the often vicious infighting that goes on in the world of music publishing (these are my own musings and not those of Mr. Foley), antagonism, petty rivalry, even enmity, among rival composers, and Pacini's own lack of zeal in promoting his music. It might have to do, musically, with Pacini's resistance to the "grand" new music of Verdi, not to mention Wagner. Though he was an innovator in some things, he resisted overpowering orchestration and dense harmonies. He was a believer in the power of the simple, beautiful melody. There may also be political considerations. Pacini started to fade from our musical consciousness in the mid-1860s, a time of terrible turmoil in Italy. For part of that decade, southern Italy was under martial law because of lingering resistance from Bourbon sympathizers. Pacini was a southerner. Verdi, on the other hand, was the champion of Italian unity. All of these things taken together may (or may not) help to explain the enigma of Giovanni Pacini. Recent revivals of a few of his works are encouraging. I have received this recent update from Pacini enthusiast, Adrian van der Tang. He confirms that Dan Foley [referenced above] no longer maintains a website on Giovanni Pacini, but that he (van der Tang) has started his own! It is at this URL. It is done very well, is clean and nicely organized with links to a lot of downloadable and searchable material on the composer. Have a look.